Use rolling pin to flatten each bread slice to 5x3-1/2-inch rectangle. Cut off and discard crusts. 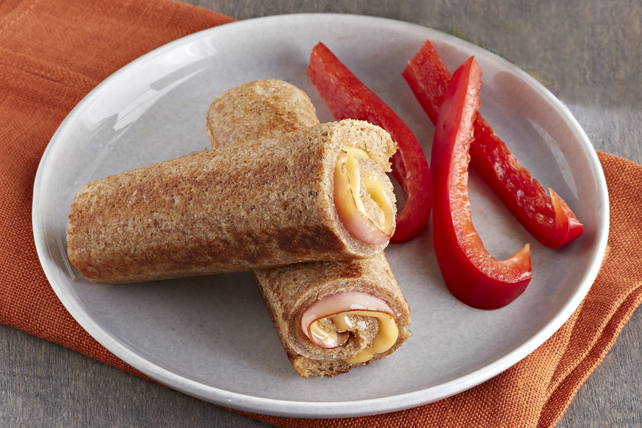 Top bread with Kraft Singles pieces and ham; roll up tightly. Spread with Miracle Whip. Add roll-ups to small nonstick skillet; cook on medium heat 2 min. on each side or until Singles are melted and roll-ups are evenly browned. Prepare using your favourite variety of sliced deli turkey. Round out the meal with 1/2 cup red pepper slices and apple juice.